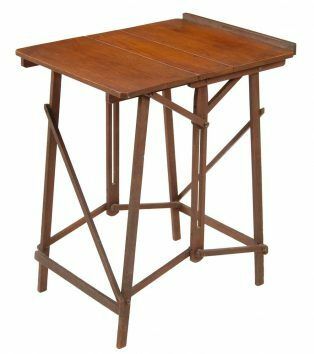 Hatherly folding table is bi-functional and can be folded out to form a flat table or partially folded to form an easel. 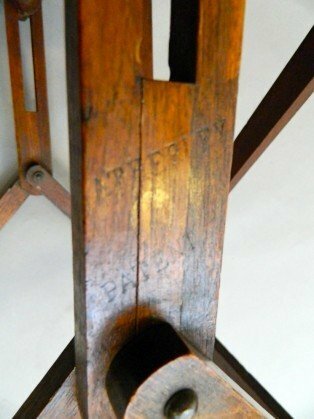 The table carries the Hatherley Patent stamp to one of the supports. Hatherley patent tables were invented for military purposesby Charles Allen Jones, seventh son of Anthony Gilbert Jones (mayor of Gloucester on three occasions) of Hatherley House now Hatherley Manor Hotel. Charles Allen Jones was an inventor of useful folding furniture and is famed for the invention of the Hatherley Lattisteps – the forerunner of the stepladder, and established Jones and Co which became the company that mass produced deck chairs.